Rigid silicon solar panels dominate the utility and residential markets, but opportunity exists for thin-film photovoltaic and emerging technologies notable for being lightweight and flexible, according to scientists at the U.S. Department of Energy's National Renewable Energy Laboratory (NREL). 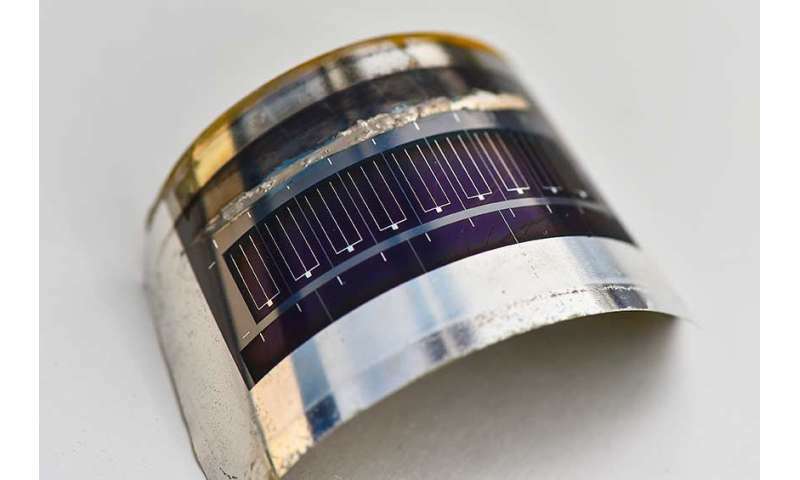 Thin films such as cadmium telluride (CdTe) and copper indium gallium selenide (CIGS), along with perovskites and other new technologies, could be ideal for generating the electricity needed for unmanned drones, portable chargers, and building facades. The opportunities and challenges inherent in widespread adoption of these ideas appear in the new Nature Energy paper, "Increasing Markets and Decreasing Package Weight for High Specific Power Photovoltaics." "We explore the limits behind power-to-weight ratios and how this can generate value for emerging players in photovoltaics to enable them to reach gigawatt scale without having to directly compete with silicon solar panels," said Matthew Reese, an NREL researcher and lead author of the paper. Silicon panels constitute 95 percent of the global solar market, generating electricity for utilities, residences, and businesses, but the researchers identified applications that must consider value propositions beyond the standard value triad of cost, efficiency, and reliability used for conventional photovoltaic (PV) panels. Flexibility and portability will be important factors, with the performance of the technology quantified in terms of watts per kilogram. Aerospace and unmanned aerial vehicles – Powering satellites is driven by extremely high launch costs; whereas, there is an increasing desire to keep drones aloft for very long periods. For both of these applications, limited space makes efficiency and weight critical and cost secondary. A key player in this market is III-V PV, but while highly efficient it's also too expensive for many applications. Portable charging – Making it easy for one person to install or move a portable charger is driving the need for PV technology that's efficient and flexible. Finding the correct balance between those requirements and cost could put millions of units into service by the military, disaster relief workers, and recreational users. The NREL team determined the lower limit for a lightweight PV device is between 300 and 500 grams per square meter. Below that would reduce reliability, durability, and safety. A lightweight module on the lower side of that range could generate more than a kilowatt of electricity from something that weighs as little as a six pack of soda. Conventional modules, even without the additional weight from the mounting equipment, might require 150–200 pounds to generate this much power.